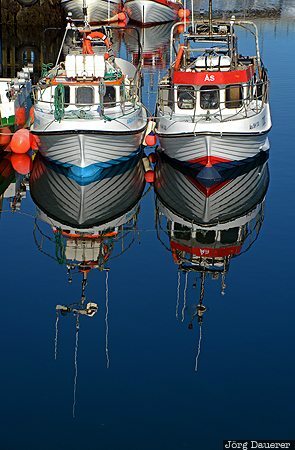 Tow fishing boats and their perfect reflexions illuminated by warm morning light in the harbour of Stykkishólmur at the Snæfellsnes Peninsula. Stykkishólmur is in Vesturland in the west of Iceland. This photo was taken in the morning of a sunny day in June of 2012. This photo was taken with a digital camera.